Day 7: Begin multi-day supported ride. 12 km. (7 mi.) Overnight at Tent Camp at Cacho Ranch. Day 8: Ride to view Northern Patagonia Icefield. 12-18 km. (7-11 mi.). Overnight Tent Camp at Glacier Camp. Day 9: Continue ride down valley. 12-18 km. (7-11 mi.) Overnight at Tent Camp at Cacho Ranch or alt. camp. Day 10: Complete ride trek. 12-16 km. (7-10 mi.) Overnight at PF Guest House, Main Ranch. Day 6: Today you’ll meet some of the ranch’s sturdy Criollo mounts and become familiar with the comfortable Gaucho tack. Plan on riding and exploring as you get to know the horses and some of the surrounding terrain. The horse is one of the most salient features of everyday rural life here and visitors soon notice the ubiquitous mount, saddled and waiting outside each sparsely scattered homestead. Here, the relationship between horse and rider begins early in life. It is no surprise to come across a child atop a horse, far from anybody, confidently riding along a mountain path. Day 7: Begin the day with yerba mate, a bitter tea sipped from a gourd through a metal straw. It is a traditional start to any Patagonia day and an important social custom. After a hearty breakfast the horses are saddled, the packhorses loaded with food and camping gear, and you begin your trek. Day 8: Mate and breakfast are around a campfire this morning as you watch the long, creeping approach of the morning’s sun slip down from the peak tops to the valley floor. 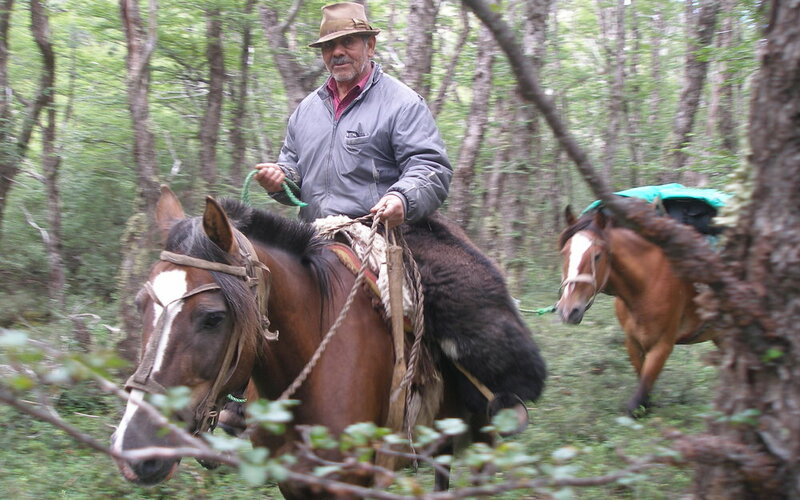 Today, you ride and explore an untouched depth of wild Patagonia that is seldom revealed. Trekking/Riding distance is approximately 0-18 kilometers (0-11 mi. ).